Hafer Case designers and makers have many case wall options from which to draw. Wall panel thickness and composition are chosen based on the purpose of the case, how it will be transported and the weight and sensitivity of the cargo the case will contain. 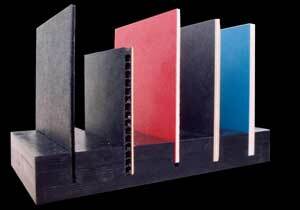 A variety of wall materials are available including laminated plywood, Coroplast, Pozi-Lite, carbon fiber, fiberglass, aluminum and any other types your specifications may require. Hafer offers a virtual rainbow of possible colors for case walls (see chart below). You can express yourself or color code for contents, or perhaps match your business or team's logo. Thickness, gauge and color possibilities for special materials such as aluminum, carbon fiber, fiberglass, etc. are specified on a case by case basis.